Still looking fresh at this point! I gave myself an hour to get ready which was ideal – I was ready in about 45 minutes so that gave me a bit of breathing space. Even if it did mean getting up at 3:30am! Riesje picked me up (along with my 5 drop bags) at 4:30 and we drove to Louise and Jimmy’s place – Jimmy would drive us to the start. On the way I had my usual breakfast shake – it would have been way too early to have it at home! There was a big crowd already when we arrived just before 6:15 – turned out the 6am start had been delayed and they set off not long after we arrived. At the start line surrounded by Team Mekong. 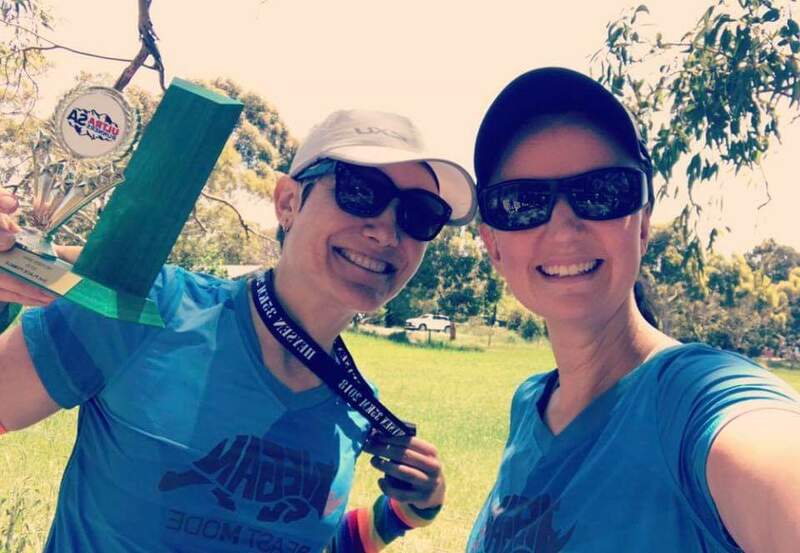 Mekong supplied my top and I found it fantastic to run in – thanks guys! I realised that my hydration bladder was leaking – there was about 1 litre in it when I left home, and by now it was down to about 750mL. I decided that, given the cooler conditions, and the fact that I don’t tend to drink water during runs anyway, I would empty the bladder and carry it empty, just in case. 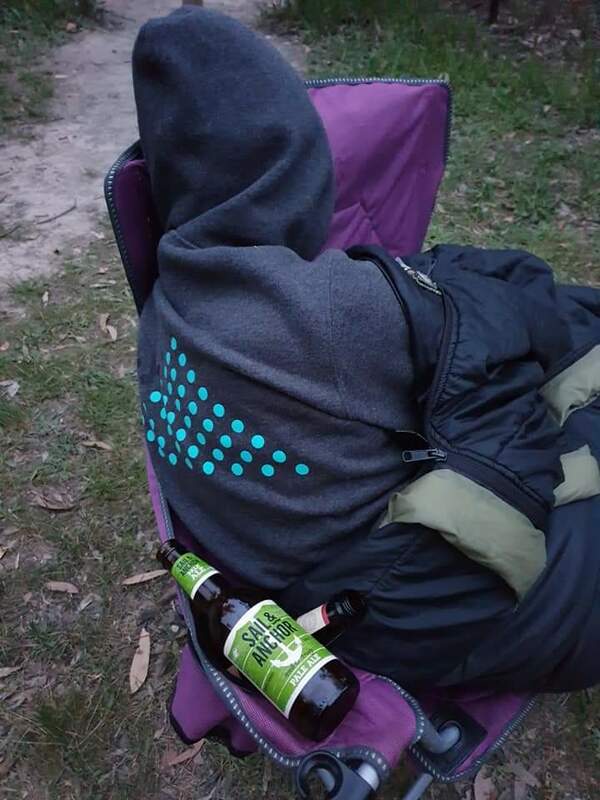 (It was part of the mandatory gear anyway – capacity to carry 2 litres of water – so I had to carry it regardless.) Not only did it mean I wasn’t going to get unnecessarily saturated, it made my pack lighter and more comfortable to carry! I collected my race bib and bought a new blue Yumigo buff (which matched my calf sleeves and shoes perfectly!) before depositing my drop bags in the appropriate places. Happy days at the start line! It was COLD! I was dressed to run, but while standing around waiting I think my lips matched my buff! Michelle’s husband Mark kindly lent me his big warm jacket! I soon gave it back and then Tina, on registration, took pity on me and lent me hers for a while! I hesitate to write this but I think it’s an important part of the story. Before the race I decided that I couldn’t wait for Checkpoint 1 (around 18km, approx 2 hours) for a toilet stop. A few of the girls were venturing into the bushes and I thought bugger it, I want to be comfortable at the start! So off I went, first time successfully pulling off the ‘bush wee’ and was so glad I’d done it! It also gave me confidence that if I needed to, I could go anywhere and not have to rely on going at checkpoints! That ‘TMI’ moment aside, it was soon time to make our way to the start line. Having been advised on Thursday that our waterproof jackets were NOT required (I didn’t 100% trust the weather so I’d packed a light spray jacket in my pack just in case), as if on cue, it started raining as Ben did the race briefing! Because of the late start of the 6am wave, the other waves in turn started 15 minutes late. But given the rain, and after the crowd demanded it, Ben agreed to let us start at 7:10 instead of 7:15! This was greeted by rapturous cheering! This was the last of 3 waves, with all the 57k runners as well as roughly half the 105k runners setting off together. 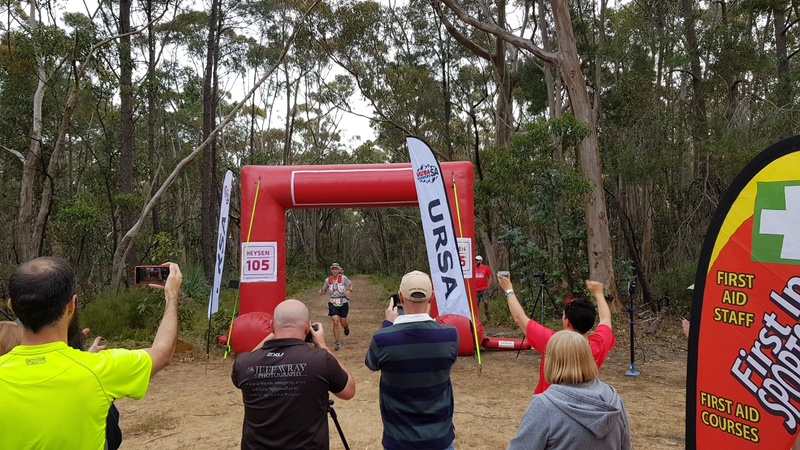 At the start I saw Bronwyn who finished 3rd ahead of me last year, Kazu who finished 2nd at Yurrebilla last year, and Hoa, who is in awesome form. I had had thoughts of maybe going one better than last year and getting a podium finish, but after seeing those three I quickly put it out of my mind! And we were away! The rain wasn’t so bad once we got moving. Very early on there was an absolutely stunning full rainbow against a grey sky. I was so tempted to take a photo but I didn’t want to waste a nice downhill runnable section. I thought about the pot of gold at the end of the rainbow. In my case, it was a chocolate donut! The presence of the rainbow was very appropriate also, given that the Pride march was taking place on the same day! Early on I ran with Marc and an interstate runner by the name of George who I’d heard plenty about but had never met. 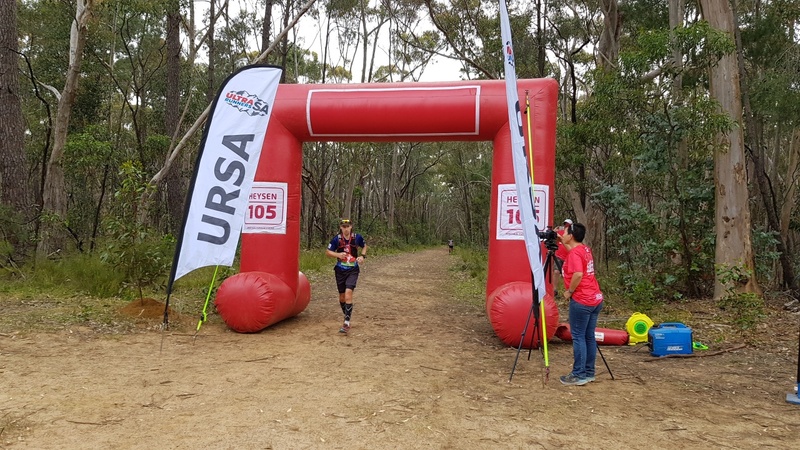 Marc told me his reason for running was to try to better his UTA100 time from this year, because the last time he ran Heysen he was just aiming to finish. This time he was taking it seriously! I didn’t quite get a ‘why’ answer out of George but I think it was along the lines of ‘Because it’s there’. I also went back and forth with Uli and Justin – Justin would effortlessly power past me going up the hills, and sometimes I would pass him going downhill. Very early I was passed by Hoa who told me she was volunteering at the finish line. 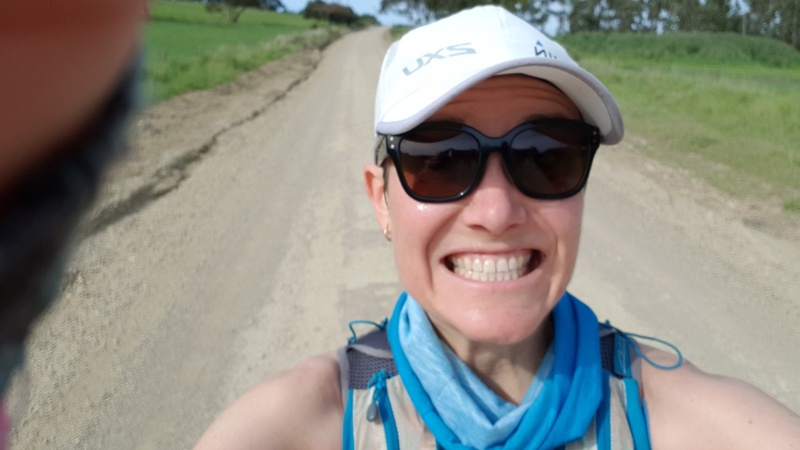 I was gobsmacked until she told me she was ‘only’ doing the 57k! Ah, maybe there was a chance for me after all! The first section is a relatively easy one, and I reached CP1 pretty much on target (I’d given Gary my CP splits from last year as a guide, and I’d also attached a laminated copy to my backpack). 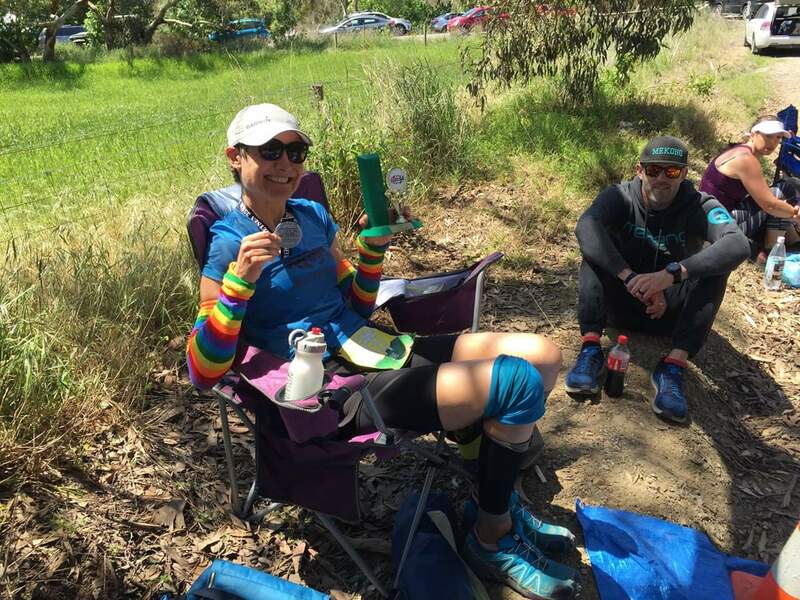 It was a quick stop – sunscreen on, a quick Coke and a handful of pretzels, and I was on my way – my watch showed 1 hour 50 which was 7 minutes slower than last year. Last year’s split times, I used this as a guide. After CP1 came probably the hardest section elevation-wise. There was a lot of uphill in this section. It gave me the opportunity to take a few photos and really appreciate the scenery! That’s Kelly up there in the distance! They say ‘Never look back, you’re not going that way’. Sometimes it’s good to look back and see how far you’ve come. Wow, I’m deep! Can’t see the woods for the trees! Lovely spot for a run! It was around this point that I was reunited with George, and also met up with Kelly who had done the 6 hour with me earlier in the year. 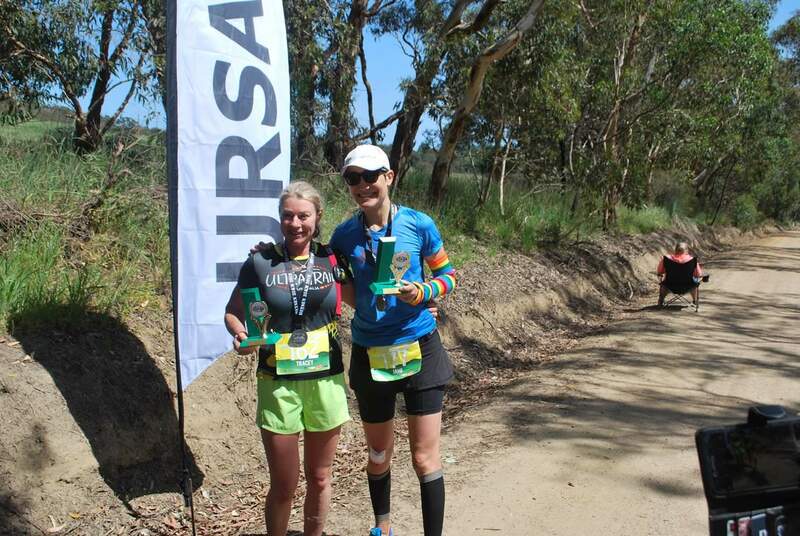 I quickly realised by looking at Kelly’s bib number that she was in the 57km event and therefore not competing with me! George had a lot to say and I really enjoyed chatting with him. He does an ultra about once a fortnight. He’s done quite a few events here in SA which is why I initially thought he was a local! We would end up running together for most of the first half of the race. He, like me, was having his buddy runner, Beck, meet him at CP3. He said that this was all he was focusing on – just get to CP3, that’s the end of one race, and then the race begins again! George hadn’t met Beck before. 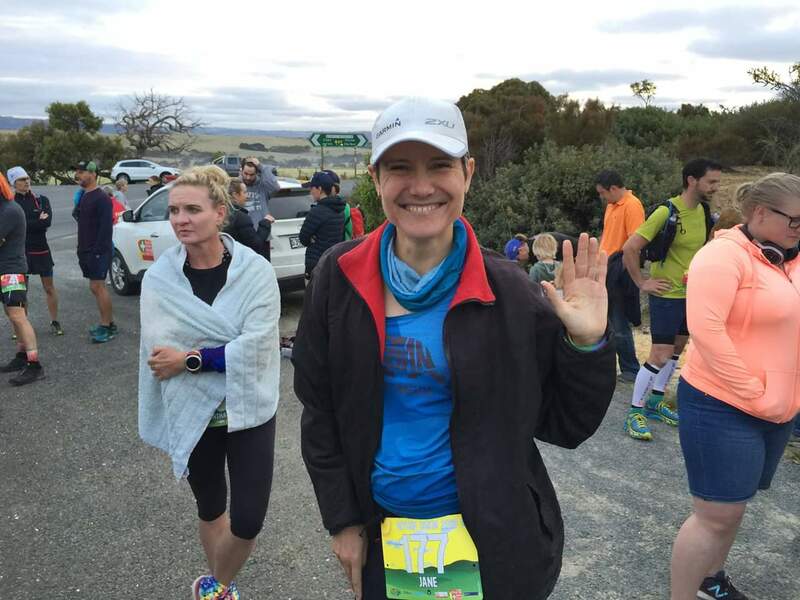 I hadn’t exactly met her but I’d heard her speak at a Trail Running SA social night about her experiences doing ultras around the world including iconic events like Western States 100 and Ultra-Trail Mont Blanc. I told George he’d be in excellent hands! Fuelling up at CP2 and catching up with the 35k finishers. I was with George early in the next section and I announced to him that this was the 10k I’d marked so if there were any problems he knew who to blame! 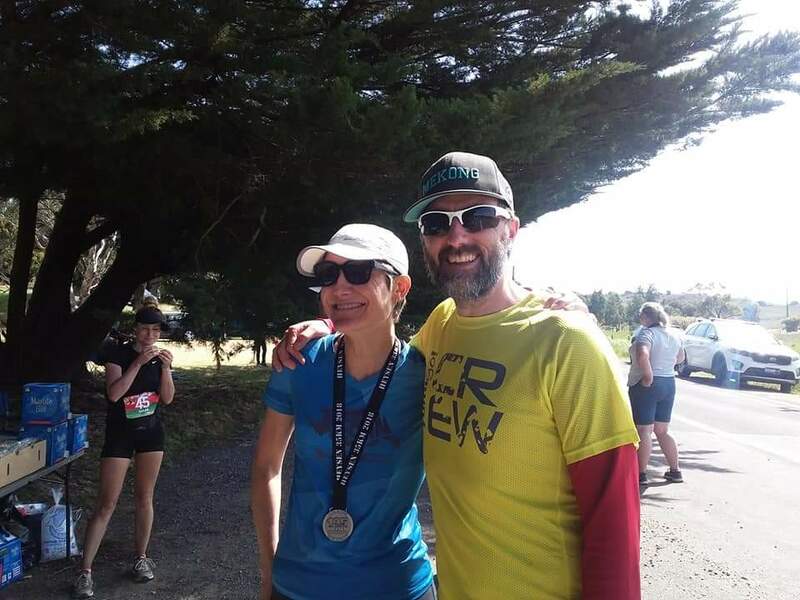 I must say Tina and I did a brilliant job – one or two of our red and white ribbons had come down overnight, and we possibly could have more clearly marked the direction where the tractor and the bed was, but other than that it was a flawless 10k. I told George, who is a devotee of the ‘runfie’ and also the ‘cowfie’, as we were doing one of the climbs in Yulti Conservation Park, to look back and see the view. He did, was suitably impressed, and then asked me to take a photo of him with the view in the background. I crouched down to get a good pic and immediately regretted my decision! Fortunately I managed to get up without too much trouble! Our section was quite overgrown in places – I could have done with a scythe to get through, I did feel a bit Indiana Jones-ish at times! A funny moment came just after the 40k mark. We had to go over or under a fence that appeared to be just a rope. I opted to go over – and in the process discovered that it was an electric fence! I’d never been zapped by an electric fence before! George didn’t want to take my word for it, he had to touch it himself! And then decided that this was a perfect opportunity to get some free ‘electrotherapy’ for his injuries! I warned the people behind that it was an electric fence and we kept moving. By the time we hit 45k and the end of Tina’s and my section, Kelly was back with us again. “Only City-Bay to go” I told her. The next 12k had been very ably marked by 2 course marking newbies Kate and James. 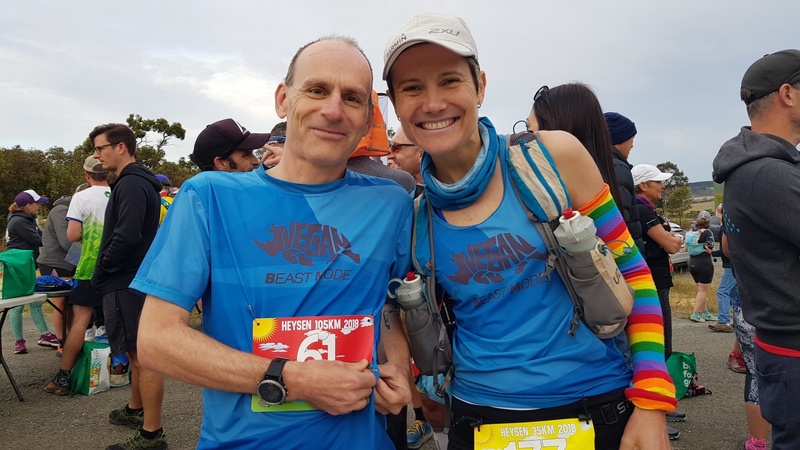 With George around 45k – great fun running with this guy! 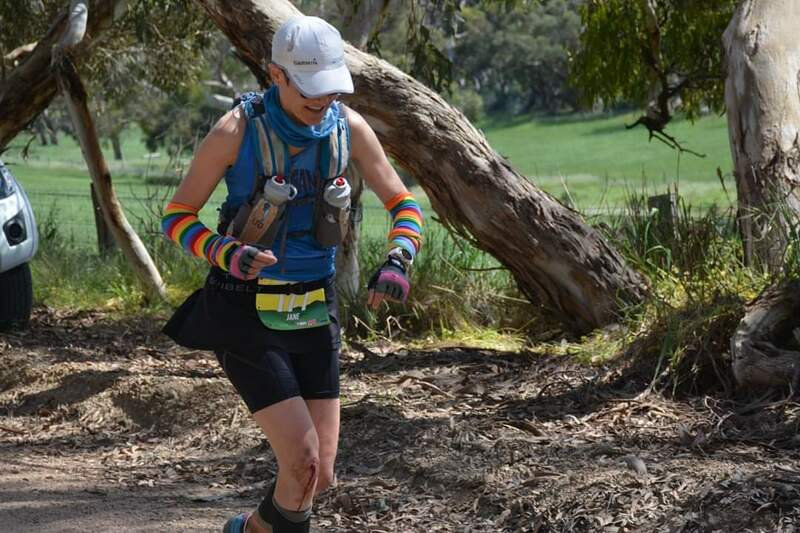 With Kelly around 45k – she only had 12k (or ‘City-Bay’) to go at this point! The sandy sections through here were made much easier by the recent wild weather – wet sand is much easier to negotiate than dry! 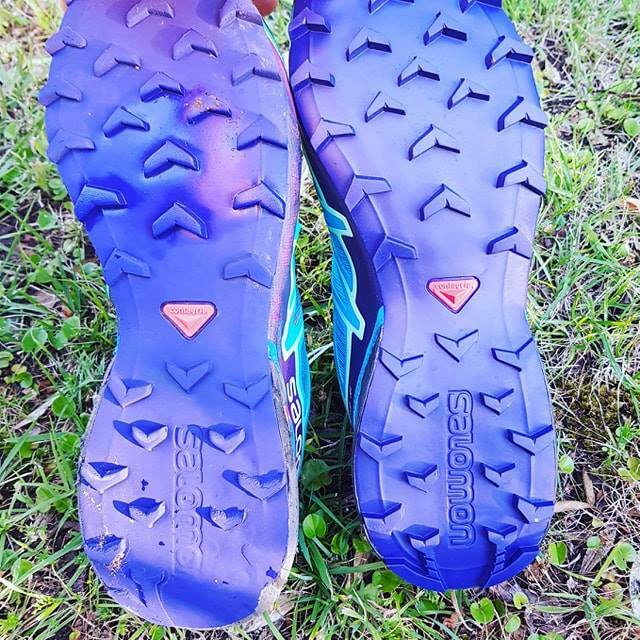 There was a lot of mud and water throughout the 105km and once my feet were wet and muddy I didn’t really care about trying to avoid it! 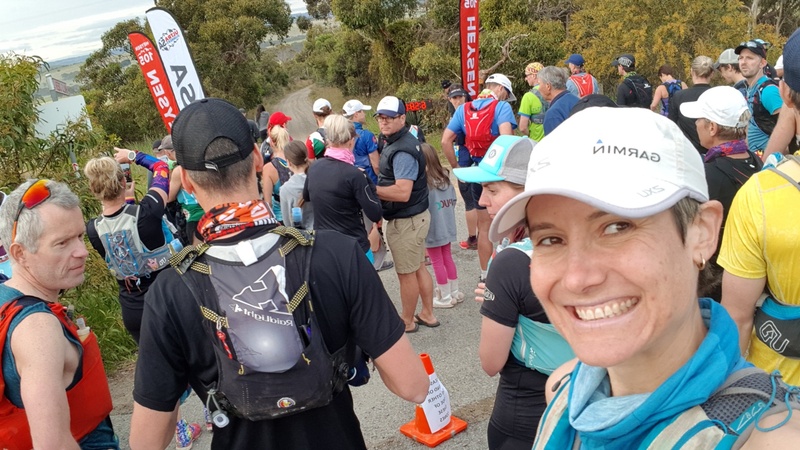 There was also a lot of debris on the course which may have contributed to me being a bit slower than last year – I was extra cautious to avoid falling like I had last year (and the day before!) in this section. Somewhere along here we were met by 2 runners coming the other way. I immediately thought, we’ve taken a wrong turn! But not to worry, it was just Maurice and Hayley who were demarking and sweeping! Phew! 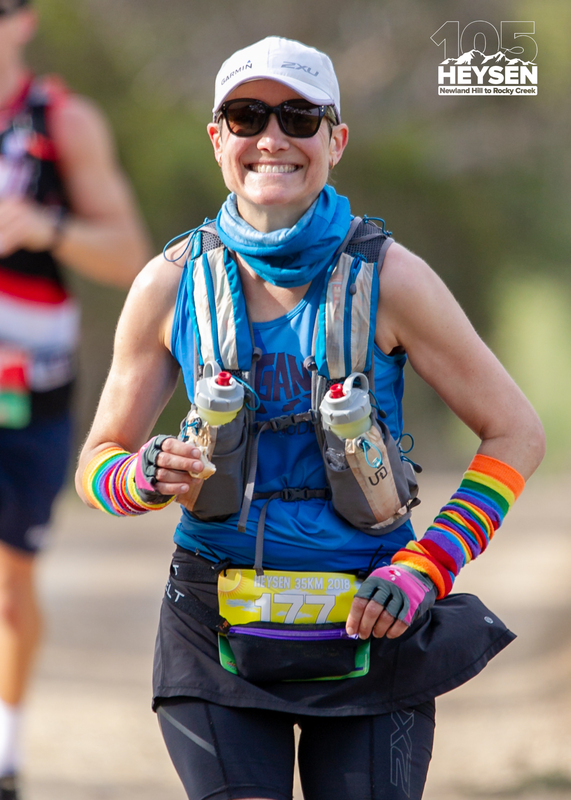 I had taken my caffeine supplement at CP2 and at around the 49k mark it kicked in and I took off from George and Kelly. 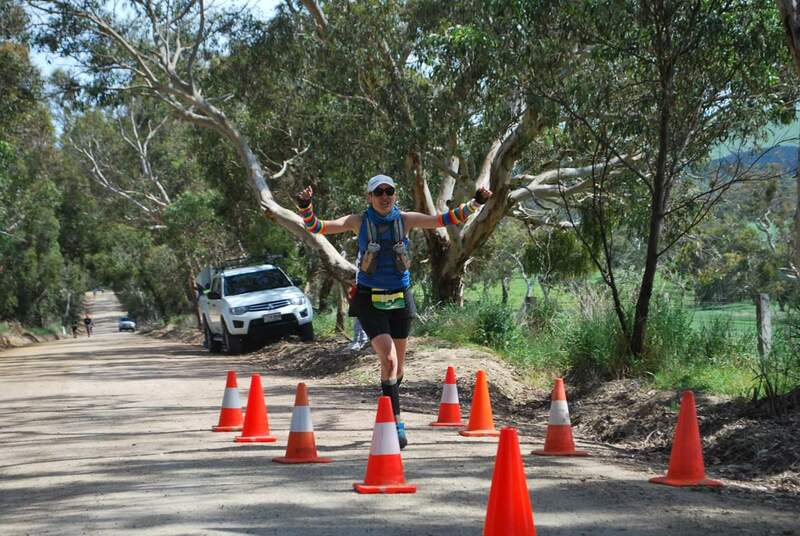 Partly I think I just needed a short burst of ‘alone time’ knowing that I was going to be meeting Gary at the next checkpoint and would be with him for the rest of the race. Also I was conscious that I was behind time so wanted to try to make up a bit of time. I’m not sure why but somehow I’d got the idea in my head that I was about to reach 55km. When I saw the next 5km marker and it said 50km, not 55km, I was a bit deflated but kept pushing on. At this point I became aware that not only did I have a few rocks in my shoes, but I could feel some rubbing on both my pinky toes – I hadn’t done a very good job with my taping! I was thinking about stopping at CP3 to get the first aider to look at my feet and re-tape if needed, but I didn’t have any clean socks on me and did not fancy putting my wet, muddy socks back on! I had thoughts about telling Gary the goalposts had shifted and we were no longer looking at a PB, just a finish! Eventually after a long road section I reached CP3 where Gary was waiting for me. 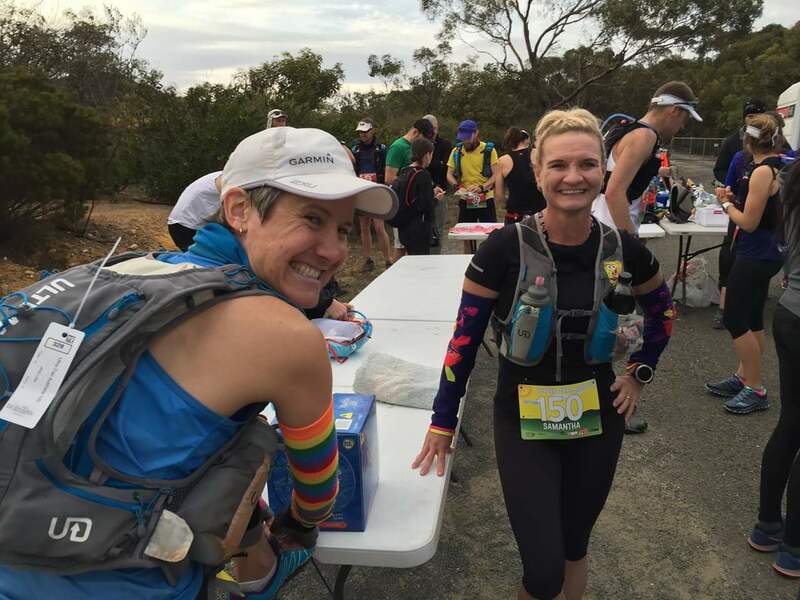 Heading into CP3 – thanks to Sharlene for this photo! I took my shoes off to get rid of the rocks, but left the socks on. Here, as well as refuelling with Gatorade and snacks, I went for a quick wardrobe change, a fresh singlet and arm warmers. And off we went! This was the section where everything had gone horribly wrong last year! It was great to have Gary with me here as he had run this section 2 years ago as a buddy and remembered it well. Heysen involves climbing over a lot of stiles to go through cow paddocks. One such stile, early on in this section, happened to be over another electric fence! I found this out the hard way, giving myself an electric shock – it was quite a powerful zap compared to the last one! Best not be doing that again! I was pretty sure I knew who was responsible for this. My suspicions would later be confirmed! After crossing that field without incident, I was again thankful for Gary’s navigational skills. After last year’s incident, I had finally found my way out of the field by following Brenton. Consequently I hadn’t really paid attention to what came next, so I did not recognise the next few kilometres. Thankfully Gary did! Soon I was back on familiar ground, a nice, comfortable runnable section through ferns. I knew we were back on track – we had to have gained about half an hour right there. Gary had updated me on what was happening in the race. In the men’s, Howard was leading and looking strong. 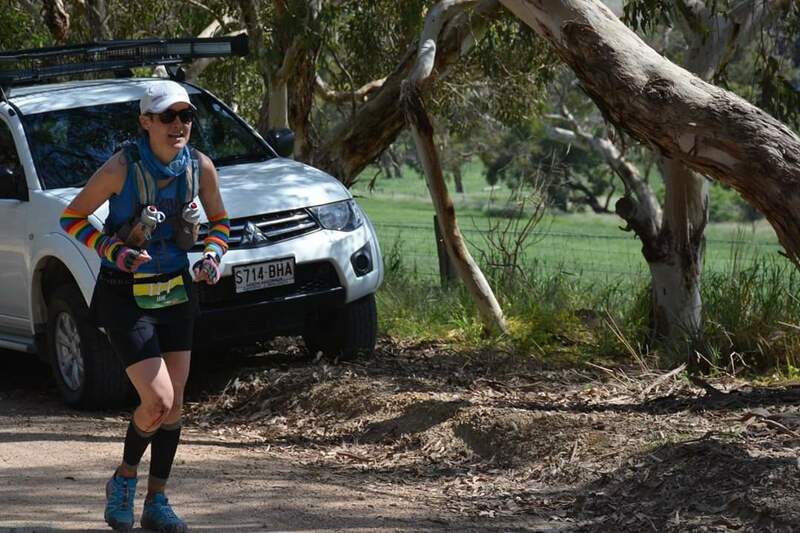 He wasn’t sure exactly where I was in the women’s race – Bronwyn was a runaway leader followed by Kazu. There were 2 other women who he didn’t know, and then me. He wasn’t sure if one of the two other women was an early starter (this would not only mean they were an hour behind me, but also that they would be ineligible for a podium finish). He said the last woman was 25 minutes ahead of me. CP3 – CP4 was a longer section than last year – about 18-19k. The checkpoint had been moved about 4km further along the route, and off the road. It meant it was a bit of a hard slog to get to CP4, but it meant that after CP4 we would be only 8km from CP5 and 26km from the finish! 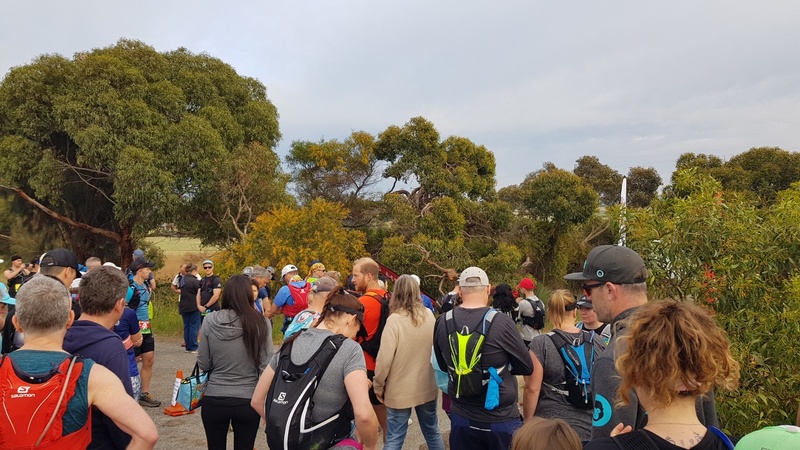 I later found out that other people had taken off their shoes and socks to go through – but then again, I only had my wet, muddy socks to put back on so I think it was for the best not to take them off! Approaching CP4 we were greeted by Paul running the other way. He was on his way to meet Simon, who he was buddy runner for. Simon had been at CP3 getting his feet attended to when Gary and I had left, but had presumably recovered well as he was on his way. Paul told us we were only about 3k from CP4. Quickly I did what I had to do. 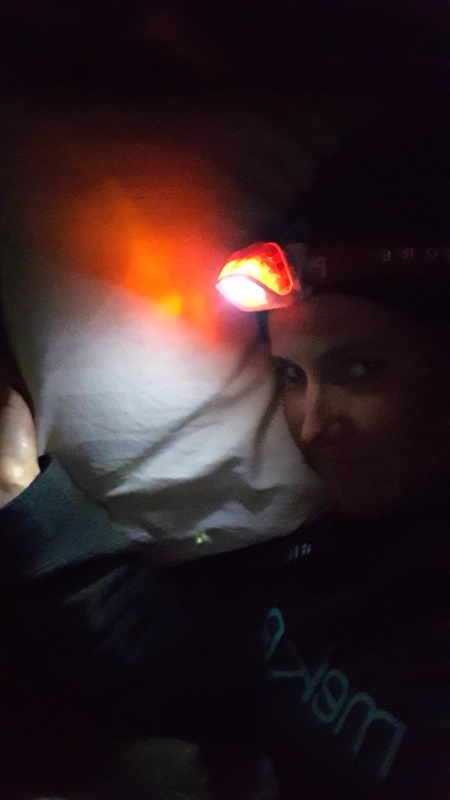 I grabbed my hi-viz vest and head torch which would be needed later, topped up my bottles and snacks (I was going to have HEAPS of food left – I had predictably over-catered! ), sprayed myself with insect repellent and got my energy drink. Still drinking it, we headed off. I had an inkling that I knew who this Rebecca was, and if I guessed correctly, she was a 6am starter! But I didn’t say this to Gary. 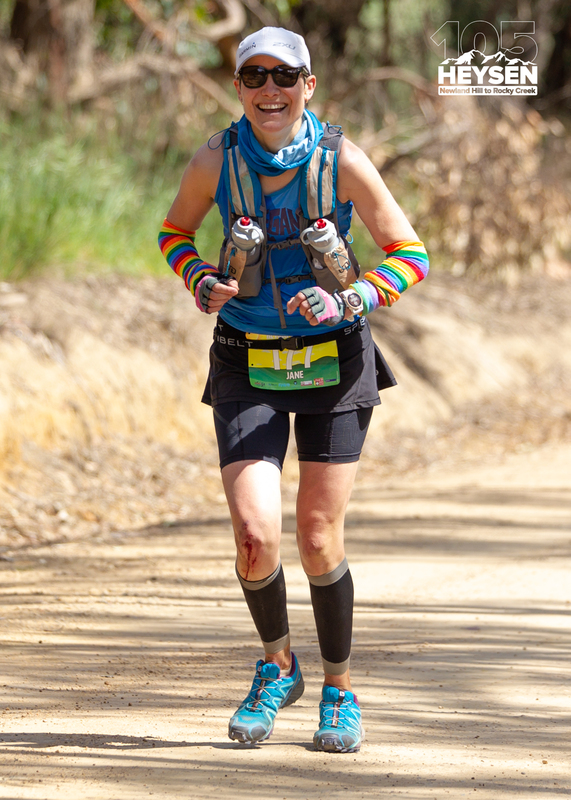 The 8km section went quite quickly and before we reached CP5 we caught up with, and eventually passed, Rebecca. It was the Rebecca I thought it was – a 6am starter! 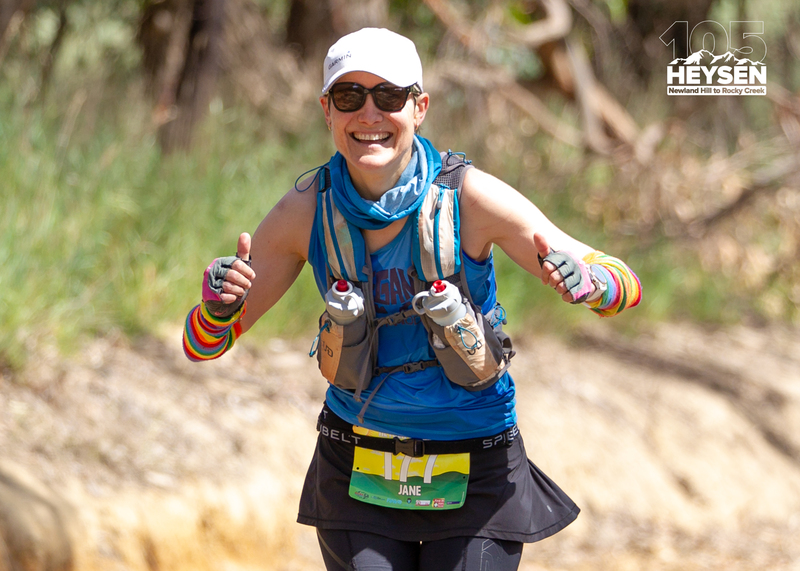 She was stoked with how she was going – she said I’d passed her at CP3 last year so she was happy to have nearly got to CP5 before being overtaken! I knew she’d marked CP3-4 so I asked her if she’d put the message to me on the sign which she first denied but then admitted she had! Before we knew it, after another river crossing, we were at CP5 where we donned our hi-viz vests, got our head torches out and had a quick snack before starting the final stage. I didn’t need to top up any of my drinks or food as I hadn’t consumed much in the short last section. The volunteers at CP5 confirmed that I was indeed in 3rd place! Gary told me that he had had a conversation with 2015 Heysen winner Andrew, buddying for David, at CP3 while waiting for me. Andrew had asked him why he was buddying and not running the event himself. Gary’s reply? “To get Jane a podium finish”. All fuelled up and about to leave the last checkpoint! On the home stretch now! We left CP5 in broad daylight, 11 hours in. Bec and another guy Ryan who we’d met in the last section, were just coming in as we left. Last year I left CP5 with 11:35 on the clock so we were 35 minutes ahead. After being 30 minutes behind at CP3, I’d really made up some ground thanks to Gary’s constant encouragement, pushing me to run when I may otherwise have walked, and of course the added bonus of not getting lost! Given that last year we did the last section in exactly 2.5 hours, sub 14 looked to be a no-brainer so we were now aiming for 13.5. 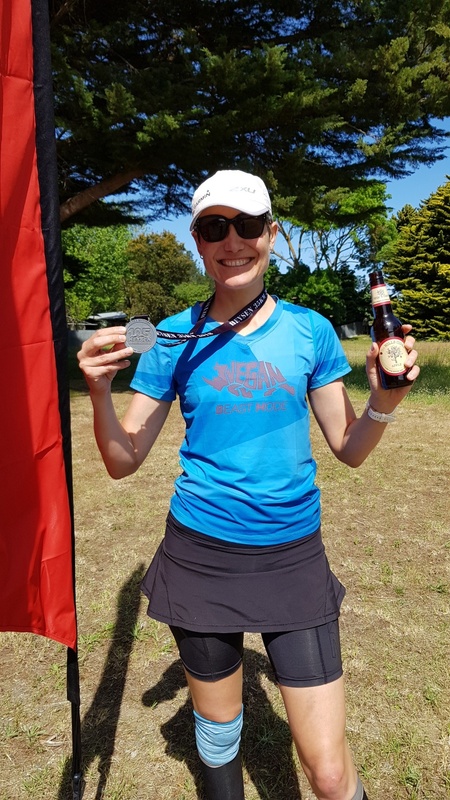 I would have been happy with sub 14 (especially considering I didn’t think it was possible after my slower first half) and a podium finish, well that was just a bonus! The last section was beautiful – much of it through forest, with not another human in sight! The roos were starting to become active – I didn’t see as many as last year, because we were in daylight for much of this section. In fact we nearly missed a turn-off because we were looking directly into the sun! Gary was constantly calculating how fast we needed to be going. He had set 8 minute kilometres as the goal from here to the finish. 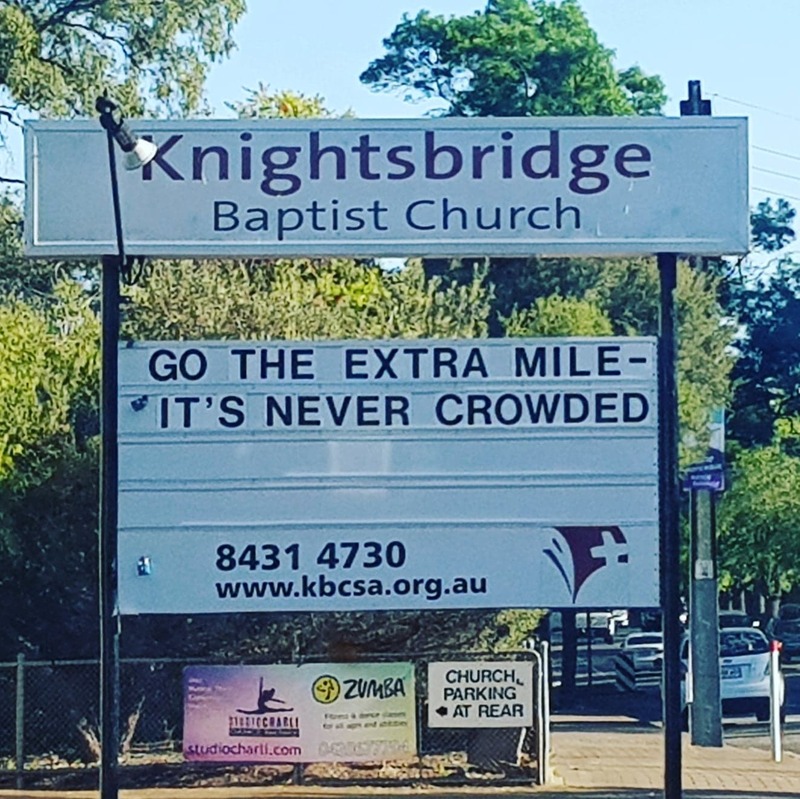 Many kilometres were faster. It didn’t really matter what I said, Gary was determined to get me in under 13.5 hours! Gary running into the sunset! Complicating matters was the fact that this part of the course was the muddiest and wettest of all. 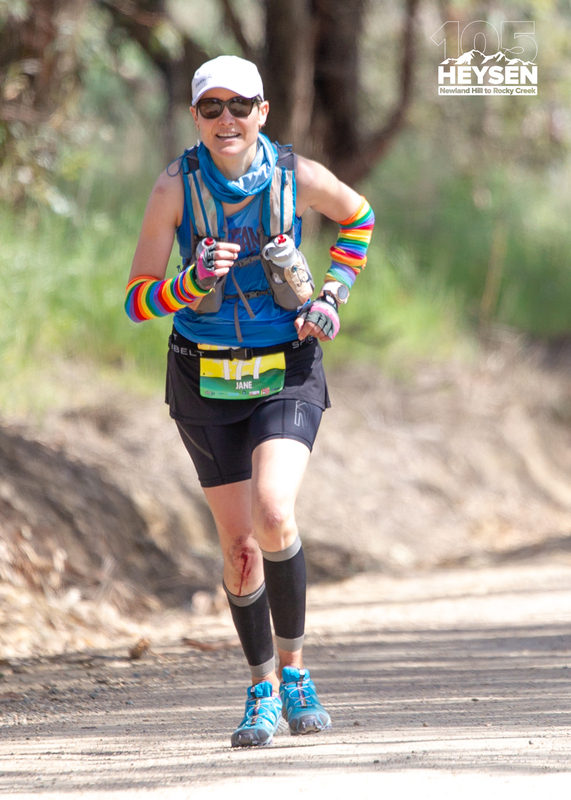 It meant we had to be more cautious in sections where we otherwise might have been able to fang it (as much as ‘fanging’ is possible after 90km!). We were glad to be doing most of this section in daylight. One of the hardest bits was right near the end when it had just got dark and we struggled to find a path through the mud! We made it to about 96km (of an estimated 102km) before we put the headlights on. By now, we would be only about 45-50 minutes from the end. So close! Probably around the 100k mark, with 13.5 hours looking good, Gary (who had all along been looking behind to see if any potential rivals were gaining on us) informed me that there were 2 people rapidly approaching. I told him I had no capacity to increase the pace! As devastating as it would be to be passed so close to the finish, if someone passed me now, there was no way I was going to be able to chase them down. Whoever it was, was FLYING! They passed us… I was excited to see that it was my old mate George and his buddy Beck! They were both looking SO strong for this late in the race! Gary got a bit dejected, thinking Beck was overtaking me into 3rd place, before I quickly told him no, it’s all good, she’s a buddy, she’s not in the race! All was good again! Beck estimated there was only a couple of kilometres to go! Eventually Gary announced that we were nearly there! What a rush, crossing that finish line in 13:26:46 – almost 40 minutes better than last year! Ben put the finisher medal around my neck and handed me the prized 3rd place trophy! AMAZING! Gary’s wife Christine was there to capture the moment and help me get my shoes and socks off (we gave up trying to get my calf sleeves off – they were there to stay) and get my drop bag to put some warmer clothes on. Gary and I enjoyed our donuts – I doubt I’ve ever had a better tasting donut in my life, despite it being a day old! We had a chat to other runners – Leon had done well, and Marc’s buddy Arwen had told me Marc had had a great run too. Then it was time to go before we got too cold! 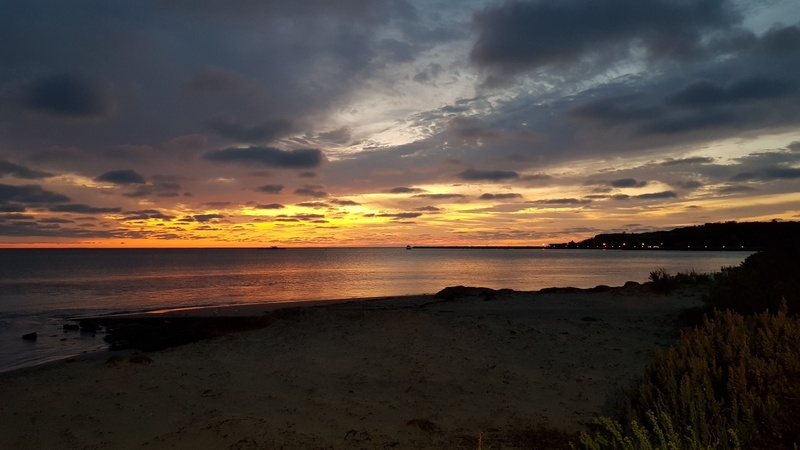 Gary’s car was also at the finish line – Maurice had asked him if he could borrow it earlier in the day so he didn’t have to get his wife to pick him up, which worked out really well as we didn’t have to go back to CP3, we could go straight home! I got a lift with Christine and was home by 10! Took me a while to get my calf sleeves and tape off, shower and eat everything in sight! Possibly the biggest miracle of the day though was the fact that I managed to get my compression tights on! I’d like to finish by thanking some of the people who played a big part in my day. Apologies if I forgot anyone, there were just so many! To Ben Hockings for putting on yet another brilliant event. So many hours of work went into this. I don’t think he sleeps. Ever! And his hard work has paid off with numbers growing steadily by the year! To Gary, my amazing buddy runner. He was everything a buddy runner should be. Encouraging, competitive and entertaining! I could not have done this without him! To Christine, for letting me borrow your husband, for helping me get my shoes and socks off at the finish line, and for driving me home! To Riesje for picking me up so I could leave my car (and importantly car KEY) at home! And to Louise and Jimmy for driving us to the start. To Kelly and George for the company in the first half of the race (and in George’s case, right near the end too! To all the course markers – having marked part of the course myself I have a new appreciation for what an important (and at times challenging) job it is! 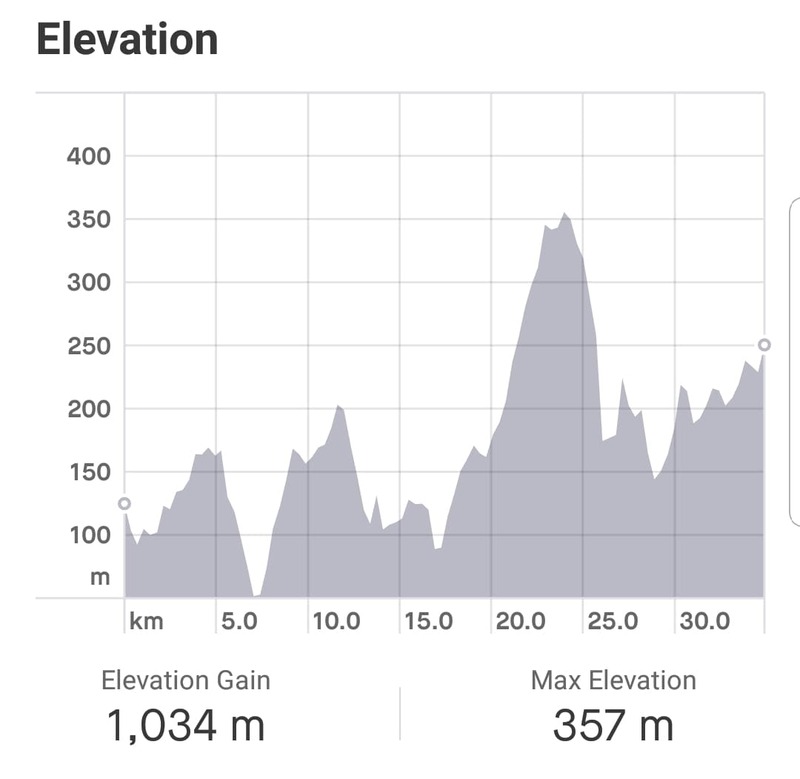 Having run the course I think I got an easy section to mark and I can only imagine how challenging that last section would have been to mark! And of course to all the wonderful, wonderful volunteers along the way. Always willing to help out with getting drop bags, filling up bottles and generally doing anything that was needed. Events like this just could not happen without them! Reckon I might have a few quiet weeks now! I’ve already told my Tuesday running buddies to slap me if I turn up to run on Tuesday!